Should I get my pet neutered? Neutering not only helps to reduce the serious problem of an unwanted overpopulation of dogs, but has many health benefits for your pet. Although neutering is not a magic cure for over-excitable animals, it reduces hormone-driven behavior and can help achieve a calm, relaxed pet. 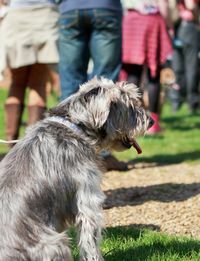 Often people find neutered dogs are less distracted and more focused, making training easier. Yes - we recommend you neuter, unless you are planning to breed from your pet. Neutering has many health benefits for your pet. It can prevent them from developing serious health issues in the future, such as certain types of cancer. 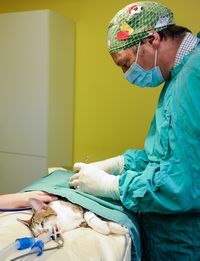 Female pets are spayed – their uterus (womb) and ovaries are removed. Reduces her chances of developing mammary tumors if done early. Makes her more even tempered as she won't have the hormonal changes of being in season. Female dogs often benefit most by having the operation when they are around 6 months old. Certain giant or large breeds might benefit from waiting until they are slightly older. Our vets or vet nurses can advise you of the right time for your individual dog. 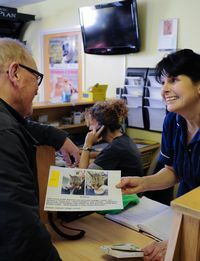 The operations done here at Wangford Vets, take place from Monday to Friday and are booked in advance. 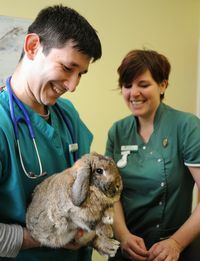 Typically, pets are admitted first thing in the morning and are ready for collection later in the day. The nurse will ask you to ring to inquire about your pet, between 1 – 2 pm when they will be able to arrange a collection time. Male pets are castrated - their testicles are removed. Can help reduce some types of aggression - your vet can give you advice about your dog's behavior. Means he's less likely to get an aggressive response when he meets other dogs. He'll be less likely to roam and go missing from home. Reduces behavior like urine marking and mounting. 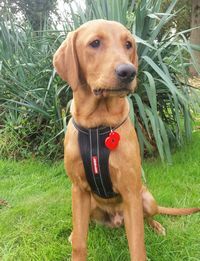 Male dogs are usually fine to be neutered at 6 months old unless they are a giant or large breed, in which case they may benefit from doing it slightly later. We will be happy to advise you when we think the right time is for your dog. When you book your operation you will be given a pre-operation sheet containing information about preparing your dog the night before the operation as well as on the morning of the procedure. When you collect your dog from the surgery you will be given a post-operative care sheet to help you through the first few days. The nurse or vet that sees your dog out will run through it with you and ask if you have any questions. An anesthetic may cause your pet to feel sleepy and unsteady on their feet so don’t panic. This behavior is normal and they should fully recover from the anesthetic within 24-48 hours. Ensure your pet is kept warm and comfortable and allowed to rest in a quiet place at home. Your pet will need to convalesce for several days before returning to normal. On most occasions your pet will have dissolvable stitches. They will not need to be removed and will dissolve in 4-6 weeks. If, however, the wound has needed to be sutured with non-dissolvable stitches, these will need to be removed at around 10 -14 days. A post-operative appointment for your dog will be made before you leave the practice. However, if you have any concerns before your appointment please feel free to call us. Should my female pet have a litter before she’s neutered? No – there’s no need for her to have a litter before she’s neutered. There’s no emotional benefit for your pet if she has a litter before she’s spayed. In fact, medical evidence shows that spaying before your pet's first season has the most health benefits. For example, every time a dog has a season, her chances of developing mammary tumors in later life increase, so neutering your pet while they're young is a great step to keeping them healthy into old age. If I neuter my pet, will they gain weight? No - only overfeeding and under-exercising cause obesity, but you may need to adjust feeding. Neutering has so many other health benefits for your pet, from preventing cancer to reducing their instinct to roam away from home. If you’re worried about your pet’s weight, there are much more effective things you can do instead of avoiding getting them neutered: Our nurses run free Weight Clinics and are happy to give advice at regular weigh-ins. Will getting my pet neutered change their behavior or personality? No - your pet’s personality is dependent on their genetics and environment, not their hormones.Neutering won’t change any underlying behaviors in your pet – good or bad. The best way to change these behaviors is through training. 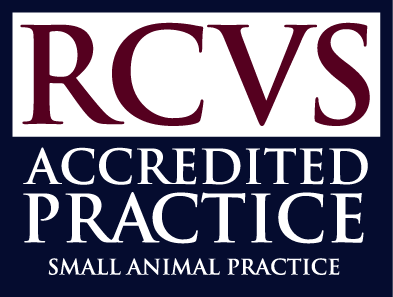 If you’re worried about your pet’s behavior it’s always best to speak to us or a behaviorist.